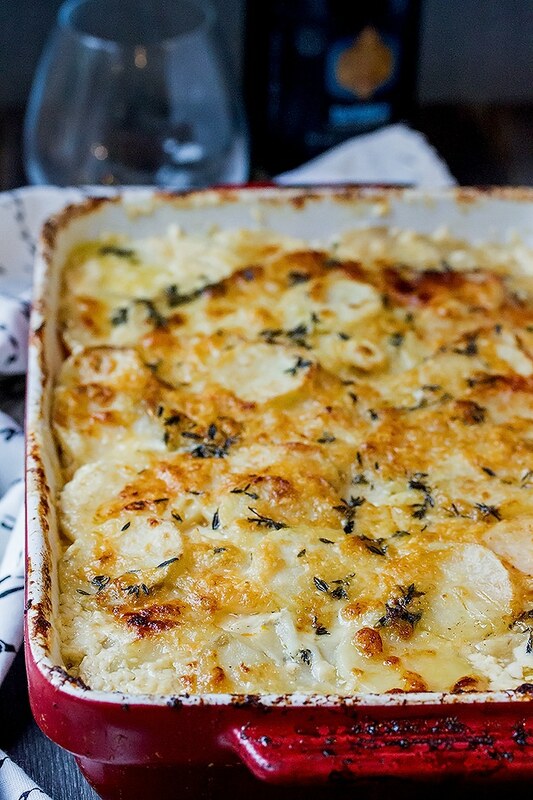 A one-pan easy and creamy potatoes au gratin recipe with three types of potatoes baked with loads of aged cheddar and gruyere! Easter dinner is next weekend! Ham is pretty much a given at Easter, but are you struggling with what to serve with it? 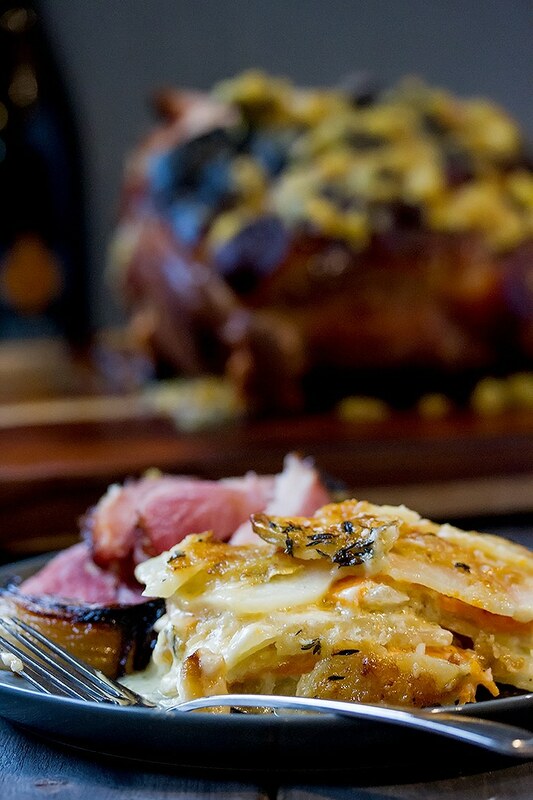 Potatoes are a staple side dish for ham in our family, but you don’t want to serve just any old plain potatoes. Plus, if you are cooking for a whack of people, you need your main side dish to be awesome, but EASY. Our family dinners are always large. At least 12 of us and often more like 15 or 16. Even for those of us that love to cook, that’s a lot of people to cook for! And no one wants to slave over the stove for hours and hours without getting the chance to enjoy the company of friends and family. I have always made potatoes au gratin by slicing up potatoes and onions, making a separate cheesy sauce to pour over the potatoes and then baking them. Its not difficult, but this recipe is even easier. You make everything in one pan and bake. No extra step of making the cheese sauce. The cheese sauce is made in the pan while the potatoes bake. Its genius! I got this idea from Kevin’s mom, Gail. Its how she makes her potatoes au gratin and they are delicious! I had to try it out and now I don’t think I will ever make them any other way. In case you are curious, like I was, about the difference between potatoes au gratin and scalloped potatoes, here it is. It basically boils down to the cheese. 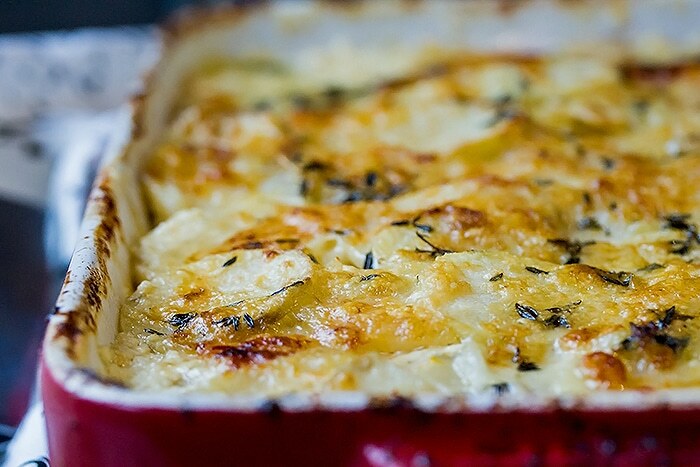 Cheese is a necessary part of an au gratin, but cheese is not necessary for scalloped potatoes. This post explains it much better, but that’s the short and sweet of it! 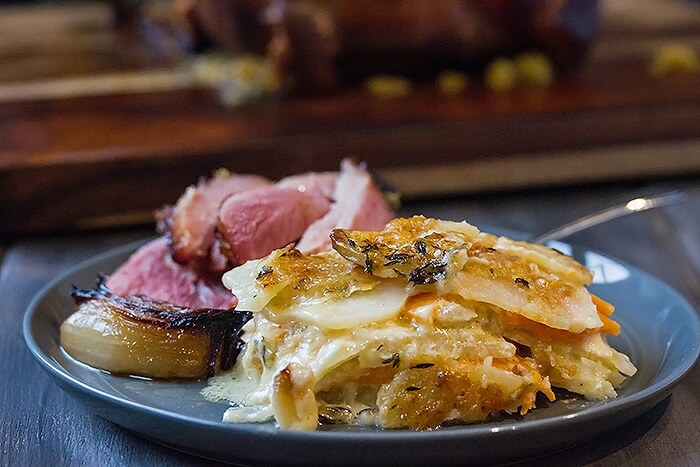 These easy au gratin potatoes are made extra special by making them with 3 types of root veggies. Regular russets, white sweet potatoes, and yams. We think it gives them such great flavor. Especially the hint of sweetness from the orange yams. I just love the flavor of a few of those thrown in. They are so delicious with all the cheese! 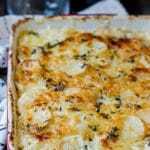 We especially love that you can make this potatoes au gratin recipe well in advance of your dinner. You can even make them the night before, cover them tightly and keep them in the fridge until you are ready to bake them. 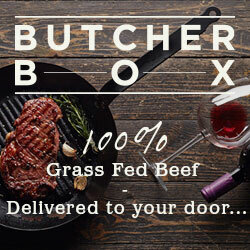 This makes cooking a big dinner sooooooo much easier and frees you up to mingle and visit. We spent Christmas with Kevin’s family at Silver Star ski hill in the Okanagan. Kevin and I drew the Christmas Eve dinner spot so we had to make dinner for everyone that day. Now, lets be honest, “Kevin and I” really means me… With 16 of us, it had to be easy and since it was Christmas, it had to be special. I made these potatoes au gratin recipe with sweet potatoes and yams and they were a huge hit. Kevin was my master potato peeler, so it wasn’t completely a solo effort ;). There were a couple people that said they were skeptical of the yams as they saw me throw them in, but after they tasted the dish, they were converted. 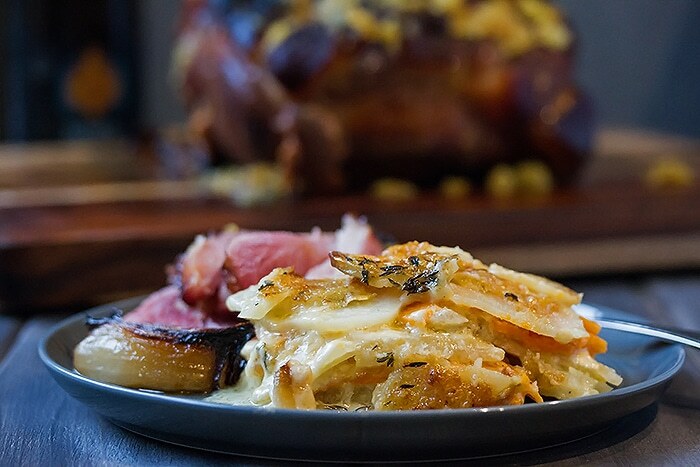 We serve these cheesy potatoes au gratin with our juicy and fall apart boiled ham or roasted ham (recipe to come soon for the roasted ham). Its the perfect paring! Casserole Dish on Steroids – the cream of the crop bakeware. A little hard on the pocket book, but it will last you a lifetime! Mandolin Slicer – slice potatoes and onions in record time! Get all your ingredients ready. Peel and slice your potatoes. Slice them thin but not too thin. We like number 2 on the mandolin. Slice your onion on the mandolin as well, or thinly with a knife. Grate all your cheese and melt the butter. Put together the dish. Put a layer of potatoes, then sweet potatoes, then yams down in the pan. Add a thin layer of the onions and sprinkle all generously with salt, pepper, garlic powder, and a quarter of the aged cheddar. Repeat until the potatoes, onions and cheese are all used up. Finish with a layer of potatoes. Pour the melted butter over top of all the potatoes, pour the coconut milk over top as well. Finish with all the gruyere cheese. Cover with a lid or foil and bake for 30 mins. Then take the lid or foil off and bake another 15 -20 mins or until the dish is bubbling and nicely browned on top. Take out of the oven and let it sit for 5 - 10 mins before serving. Looks fabulous (LOVE the coconut milk ingredient)! I have a similar recipe from years past and it is made in a spring form pan. When served, it almost looks like a quiche. I’m wondering if this might be prepared the same way…it looks beautiful when served because you can see the different colors of potatoes. Happy Easter! Yes! I think you could make this in a springform too, and it would show the colors so nicely that way Im sure! I would only be a little worried about it falling apart at first. You would have to let it cool quite a bit before serving to serve it like that. Do you use the canned coconut milk, or the stuff in the carton? Also, is this aged white cheddar? Hi Karla, yes you can use either the canned coconut milk or the stuff in the carton. The stuff in the can tends to be creamier which I think is nice, but you can use either. We used gruyere cheese for the top, but you can use any cheese you want. Ive used aged white cheddar before as well.